Some vendors are reporting as much as a 25 to 30 percent increase in video conferencing software usage. What’s driving such growth in Web conferencing services? It comes down to the demand for quality internal communications that just about every enterprise is facing. Simply put, the faster and more efficiently that employees can communicate with one another, the faster and more efficiently projects can be completed. Right now, however, many companies are struggling with the issue of user-sanctioned applications like Skype and Google Hangouts. While these solutions are free, they are limited in what they can offer apart from video and text chatting or document sharing. Further, these applications require employees to utilize disparate applications instead of consolidating them into a single communications platform—a situation that could lead to security vulnerabilities. 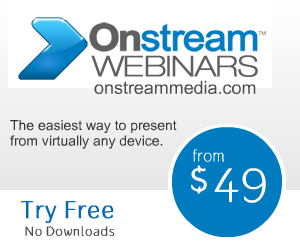 Premium third-party communications and collaboration providers like Onstream Meetings, by comparison, offer many more options for end users. In fact, Onstream Meetings is a full collaboration studio that comes with over 100 features, including the ability for end users to engage in screen sharing or a variety of chat options. The best part about Onstream is that all of the features are located in one easy-to-access hub, so that employees can spend less time moving back and forth between applications and more time completing their work.